The CNS Clock II is a GPS clock with high accuracy one-pulse-per-second outputs and software that manages the clock and keeps your computer's time synchronized to GPS. The manual is available here in PDF format. that measures 9" x 7 3/8" x 1 5/8" including connectors. The CNS Clock II is available in a rack mount version that allows up to two clocks per 1.25 inch ("1U") panel. Three external low-impedance, fast rise-time 1PPS signals, buffered to drive 50 ohm coaxial cable for "laboratory" applications. One 10MHz reference oscillator port, buffered to drive 50 ohm coaxial cable. Two external serial data ports, one RS232 and one USB, with 1PPS signal for computer applications. Two external RS485 bidirectional ports and one external bipolar solid state relay port that can be programmed to support custom applications. An RJ-45 Ethernet jack to provide a Network Time Protocol service. A high efficiency switching power supply that operates from any 9-30 volt DC source. This input is polarity independent and can even be powered by low voltage AC if necessary. Battery Backup so the GPS receiver can wake up "smart." Provides 3 or 5-volt dc power for an amplified GPS antenna. Tac32Plus software with a wide range of timing features as well as self-survey, logging, 1PPS steering, and PC clock synchronization. EMI certified to FCC Part 15, Subpart B. Accuracy: In position hold mode, <20 nsec 1-sigma. Hardware: The core of the CNS Clock II is a GPS receiver module. The standard version of the CNS Clock II features the best available GPS receiver, currently the u-blox LEA-M8 timing module. Each of the external 1PPS output signals are independently buffered to improve their drive capabilities and to prevent damage to the GPS receiver module. The buffers will drive +3 volts into a 50 ohm termination with a rise time of <10 nsec. The normal logic polarity is positive going at the epoch time, but this can be inverted if desired. An RS232 port provides 1PPS time synchronization to an attached computer. The 1PPS signal is normally connected to the computer's DCD input but connection to CTS or DSR is supported. The RS232 I/O ports are buffered and isolated from the GPS receiver module. Two serial data ports are provided, a USB and an RS232. This allows, for example, control and monitoring using Tac32Plus software on one port while the other port is used for a second computer, running NTP software. One serial data ports, a USB and an RS232. Three BNC Female buffered 1 pulse-per-second (1PPS) outputs. Power connector, 2.1x5.5 mm coaxial, 9-30 volts @ 250ma (nominal). Fuse: internal solid state resettable fuses. Optional Paging Sequencer Module interface (PTT or Busy logic). The Paging Sequencer module is an example of the kind of custom interfaces that are created to meet special needs. It is designed to control the Active/Busy states of a paging transmitter station as a specific portion of each minute to allow spectrum sharing with adjacent paging systems that have overlapping coverage areas. The interface is designed to connect directly to a variety of pager terminals by using the terminal's "Busy" line. This includes thee Zetron 2200, Kantronics Model 2000, Motorola Unipage M15 Paging Terminal and the GlenAyre GL3000. The interface is an opto-isolated solid state switch that operates much like a relay. When closed, the circuit must not draw more than 100ma. When open, the terminal voltage must not exceed 50 volts. The two interface pins may be connected in either polarity as they are polarity independent. Tac32Plus GPS Time and Control software is standard with the CNS Clock II. Tac32Plus displays the current UTC or local time. It also includes date, day-of-week, day-of-year, Local and Greenwich Mean Sidereal times, Julian Date, Modified Julian Date, and current GPS week. Other features include data logging in various formats; audible time ticks; automatically sets the PC's internal clock; corrects for time delays in antenna and measurement cables; satellite display with bar graph "S-meter"; self-survey; timing, position; configuration selections are saved and restored. Tac32Plus runs on the Windows operating system. In addition, Tac32Plus includes the following features. Time Interval Counter (TIC) module that can interface with up to eight external counters. High Performance PPS: Provides for dynamic hardware correction of the 1PPS quantization ("sawtooth") error. This reduces the noise on the 1PPS pulses from (typically) +/-27 nsec (15 nsec 1-sigma) to +/- 11 nsec (3 nsec 1-sigma). More importantly, eliminates periods of bias error caused by the quanization error going through a "zero beat" period that can last one to two minutes about every 10 minutes or so. Ethernet with NTP: Provides a Network Time Protocol (NTP) service through an RJ-45 front panel Ethernet jack. A Web browser can be used to configure port, including its IP address. Steered OCXO with 10MHz output (0.2 ppm before steering). Steered Oscillator Utility Functions: This feature provides jumper selectable oscillator derived 1PPS and 1PPM signals that can be synchronized one time or continuously with the GPS 1PPS. Enhanced holdover performance for software connected to the serial and USB ports is supported by the continuous synchronization mode combined with specific jumper settings and GPS receiver setup parameters. This can be extended to the Ethernet NTP function on special request (minor hardware modification required.). This feature cannot be used with options CNSC02-02, CNSC02-03, CNSC02-04, CNSC02-05 or CNSC02-10. CNSC02-02 IRIG-B: The IRIG-B Module provides an industry standard IRIG-B modulated time code signal on a rear panel BNC connector. The signal is buffered so that it can drive long lengths of 50 ohm coaxial cable (RG-58 or equivalent). The module can also be set by an internal jumper to provide a non-modulated IRIG-B signal for short length interconnects. IRIG-B time code signals are available in any of the three IRIG-B modulation schemes as defined in IRIG STANDARD 200-04, September 2004. These are the Amplitude Modulated Carrier (standard), Pulse Width Code, and the Manchester modulated waveforms. This includes modes B004, B007, B124, B127, B224, and B227 (CF bits set to zero unless otherwise specified). These modes are supersets of B000, B003, B120, B123, B220, and B223 but contain the BCD year data in part of the CF bit field. These newer modes will be compatible with nearly all of the older IRIG-B receivers. The selection is by internal jumper. Custom applications using the control function (CF) bits are possible. Contact CNS Systems for information. CNSC02-03 Sequencer Module: The Paging Sequencer Module is designed to control the Active/Busy states of a paging transmitter station as a specific portion of each minute to allow spectrum sharing with adjacent paging systems that have overlapping coverage areas. The interface is designed to connect directly to a variety of pager terminals by using the terminal's "Busy" line. The Zetron 2200 "Busy" interface is on the Station Card. The Kantronics Model 2000 is supported by connecting the interface to the External Carrier Detect line. On the Motorola Unipage M15 Paging Terminal connect to "Busy Channel Control" and "Ground" (pins 45 and 50) on the standard 25-pair punch block. The GlenAyre terminal is also supported. The interface is an opto-isolated solid state switch that operates much like a relay. When closed, the circuit must not draw more than 40ma. When open, the terminal voltage must not exceed 30 volts. The connector on the rear panel of the CNS Clock II is a 2-part Phoenix that allows a pair of wires to be connected to compression terminals without the need to worry about polarity. The driver circuit eliminates the possibility of ground loops between the paging system and the CNS Clock II. CNSC02-04 Genisys Module: Provides an extended GENISYS / PRCCI protocol interface with the MICROLOK II, used by the railroad industry. CNSC02-05 RS-485 RFID Timecode Module: Provides GPS-based TDM timing pulses to synchronize toll plaza readers for high speed, multi-lane applications to enable the reading of new eGo and existing ATA, Title 21/Amtech Allegro, and MARK IV/IAG tags. Also provides an inexpensive way to multiplex Airport tag readers at different sites, and for multiple protocols, allowing eGo tags to be used at airports in the region of an existing Title 21/Amtech Allegro or Mark IV/IAG tag population. CNSC02-10 Event Recorder Interface Option: This option implements a specialized pulse train output on the option port, controlled by an ASCII serial message protocol. CNSR01 Rack Mount Kit for single or CNSR02 Rack Mount Kit for dual CNS Clock II in a 1U height rack panel. Custom configurations are also available. Please call for more information. AR-10S Antenna: The AR-10S is a high performance GPS patch antenna combing a state-of-the-art low noise amplifier with a low profile, compact, fully waterproof enclosure. When connected to a GPS receiver with 2.5-5.5 VDC antenna power, the AR-10S provides excellent signal amplification in addition to out-of-band filtering & rejection. A 28 dB active patch, the AR-10S antenna operates from 2.5 to 5.5 VDC at just 12 mA supplied by the CNS Clock II. The AR-10S features a 5 meter 1/8 inch diameter RG-174 coaxial cable with BNC connector (a BNCTNC adaptor is needed for use with the CNS Clock II). The antenna design reflects a high standard for performance when operating in foliage/urban canyon environments and in the presence of electromagnetic interference. VIC-100 Timing Antenna: A high performance active antenna with vertical cable feed. Designed for easy installation. Click on the picture of the antenna at the right to access the product brochure in Adobe Acrobat format (requires Acrobat Reader V6.0 or newer). Polarization: Right hand circular, Output: VSWR 1.5 (typ) 2.5(max). 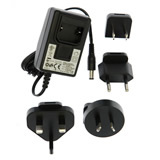 Power supply: 5 ± 0.5 VDC, Current: 20 mA (typ), 27 mA (max ). Coaxial Cable: For lengths up to 200 feet, LMR-240 cable from Times Wire is a very good choice. This cable is about the size and flexibility of CATV cable but is 50 ohms impedance and has loss characteristics similar to RG-213 while being half the diameter of RG213. Specifications: Loss at GPS frequency is approximately 9db/100 feet. Has .059" center conductor with micro-cell foam dielectric & type IIIA non-contaminating jacket. Nominal impedance 50 ohms, velocity of propagation 82%; outer diameter .240"; 100% Al mylar & 95% tinned Cu braid. Preassembled cables with TNC connectors and weatherproof heatshrink tubing are available in standard lengths of 50, 75, 100, 150 and 200 feet. Custom cables of any type coax, in any length and with any connectors are available. These can usually be shipped within 5 business days. Call or e-mail for quotes. See the ordering page for expanded parts list and ordering information.